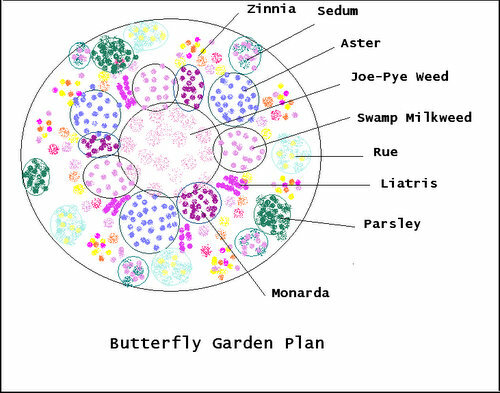 This butterfly garden plan will bring many butterflies to your garden. The perennials are hardy to zone 3 or 4 and do well in my Minnesota garden. 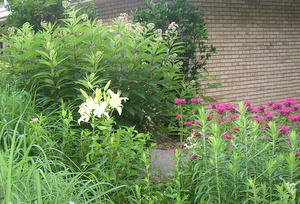 If you live in a warmer climate, Butterfly Bushes (zone 5) could replace the Joe Pye Weed. There are Butterfly Host and Nectar Plants included in this butterfly garden plan. Butterflies will come and feed at the nectar flowers and lay eggs on the host plants. Check out more information about what plants to include in your butterfly garden. The diameter of this circular island bed is about 9 feet. The plants in this butterfly garden design will bloom from July through October. If you would like some earlier flowers, add some annuals such as Pentas, Heliotrope, Lantana, Scabiosa or perennial Allium or Chives. The links in the upper left hand side of this page go into more detail on butterfly gardening, Milkweed and Raising Monarchs and Swallowtails. There are specific pages on Swamp Milkweed, Joe Pye Weed, and Aster. Check out this step by step butterfly garden design page which discusses how to go about creating and planning your garden for butterflies. 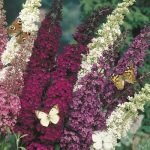 Here are seed Butterfly Garden Kits for purchase which include some of the best flowers to create a butterfly garden. The Swamp Milkweed, an excellent nectar plant to use in Butterfly Garden Plans, is also host plant for the Monarch butterfly. The Parsley and Rue are host plants for the Black Swallowtail butterfly. Monarchs are found throughout U.S. and Canada. Black Swallowtail butterflies are found East of the Rocky Mountains in the U.S. and Southern Canada. Enjoy the added activity with this butterfly garden plan. Try raising an egg or caterpillar found on the host plants. Raising butterflies is a fascinating hobby!